We help clear up clutter for people who have stuff that is not useful, serving a purpose, not sentimental or loved. ​No matter how much you have collected we help you manage it, and get your space back to normal. Collecting and accumulating things is great fun, until it takes up your walk-ways, surfaces, furniture, cabinets and garage. You get everything categorized and contained, so you will enjoy your space again. You deserve The Chronic Clutter Remedy™ help to get clutter free today. No pressure to get rid of anything. We find homes for all of your belongings and think up storage ideas too. Do you have stuff or, what? Well we know that saying "One man or woman's Junk is another man or woman's treasure". We know that certain things that you own hold lots of memories, sentimental feelings, or are just important and useful, and some, just because. Patient, considerate, confidential, non-judgmental and supportive is the key to a successful process. No pushing to get rid of things. We help you clear out of walkways, with storage solutions for all belongings. We care about you keeping what is truly important so that you will fulfill your dreams and wishes in life. Watch this video about a client who benefited from Professional Organizing! 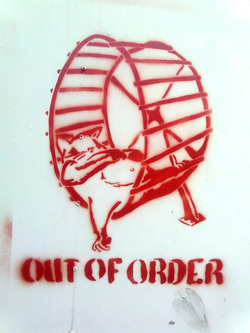 Don't be like the hamster in the wheel, thinking your going, going, going somewhere when you are clearly at a stand-still. The word 'hamster' comes from the German word 'hamstern' which means 'to hoard' according to Wiki Answers. The outer is a reflection of the inner, and if your space is fully packed with items and you cannot seem to get a hold of them, then the inner part of yourself is probably confused and dazed. Having a cluttered self and space is no fun. It takes the fun out of functional. Family, friends and the community at large recognize that having a messy and disturbed environment is at epidemic proportions. More and more people are suffering with too much clutter and stuff, and they just can't seem to keep up with organizing, storing and keeping control over material objects. 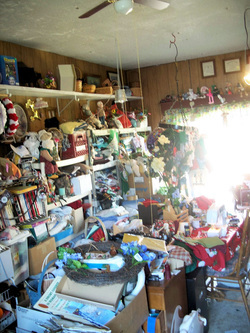 Obsessive Compulsive Behavior and Personality Challenges can contribute to serious hoarding, over-collecting, acquiring and saving behaviors, but also Attention Deficit and Attention Deficit Hyperactive Challenges, Depression, Anxiety, Fatigue, Loss, Grief, Frustration, and Physical Health and Disabilities are also a big factor in having things get out of order.